Description This was a long walk following the Icknield Way northeastwards through Suffolk. Pack Today I carried my MacPac rucksack, containing my light Jack Wolfskin tent and full camping equipment. Condition I am very fatigued after this walk, which is to be expected after a long walk with heavy pack. The worst thing is the underside of my feet, which suffered a great deal during this walk. The weather forecast for this weekend looked positive, with high pressure sitting near to the east of England. Yesterday I had heard the sad news that my paternal grandmother had died, and added to the fact that I had to go into hospital on Monday to get three wisdom teeth removed meant that I needed to escape for a while. In a few weeks we will be moving out of the Cambridge area, and one of my aims before I go is to complete the Icknield Way, a path that I have done parts of before but have never completed the whole distance. Public transport on the north-eastern stretch of this path is more troublesome than the rest, and therefore it seemed sensible to do it all in one go. Therefore last night I packed my rucksack with all of my gear before going to a project wrap-up dinner with the team in Cambridge, something which I did not really feel like going to after the sad news about my gran. This morning I got up early, filled my water bottles and headed out to catch the bus to Cambridge station. Unfortunately I had got the bus timetables wrong and had a twenty-five minute wait for the bus, which meant that I would miss the train that I wanted to catch to the start of the walk. This was annoying as the next train in an hour was indirect and would take far longer, and so when the bus finally arrived at the station forecourt thirty seconds before the train was due to leave I ran through the station without buying a ticket, the heavy pack bouncing up and down on my shoulders. I was pleased to see that the train had not yet arrived, and there were a few minutes to wait before it finally did pull in. I was slightly nervous that I did not have a ticket but the guard sold me one with no questions asked, and I settled down for the short journey to Dullingham. When the train slowed I quickly shouldered my rucksack and jumped off onto the platform, the rucksack suddenly feeling heavy on my shoulders. The GPS soon acquired enough satellites to get a position fix, and I headed off up the road. When I had last walked along here I had had to run n order to get the train, and it was nice to be able to take a more leisurely walk back It was still fairly early in the morning, and as I strolled along the road I passed a lorry being filled up with horses, seemingly to go to some competition. It seemed to take me an age to reach the main road, and then head on through Dullingham to reach the path that would take me to the point where I had left the Icknield Way a few weeks before. Back then the path had been slightly muddy, but today it was bone dry, the surface underfoot having been cut up slightly by horses' hooves. It was a relief when I eventually reached the point where I had left the trail last time, and I turned left to cross a small footbridge that brought me out into a field. Overhead the sun was shining, and already before nine in the morning it was starting to feel warm as the path took me northwards before dumping me into Stretchworth. This village seemed quite nice, but the path soon turned out of it and headed between hedges into a field. At the bottom of a slope the path rose slightly to cross a bank - the Devil's Dyke, a large dyke that runs southeastwards from the village of Reach near the Cam, and believed to be built by the East Anglian Iceni tribe. I have walked along the dyke several times in the past, and it was nice to be on it again, if only for a few yards. The path continued on to Dane Bottom, and it followed a track along this for a short distance before turning to the left to head up to a road near the church in Woodditton. The church is situated slightly away from the road and I could not get a good view of it and so I strode on, following a track that climbed beside paddocks before levelling out. On one new gate I was surprised to find a plaque stating that it had been constructed by the official providers of gates to the queen - I did not know that the scheme went as far as gates! Another road was crossed at Saxon Hall, and a long footpath between high hedges that blocked any views took me on into Cheveley, dumping me unceremoniously onto the road. To my right there was a post office and shop, and I diverted off the trail to visit this in order to buy some provisions - in my hurry to leave this morning I had forgotten to pack my food! I bought some biscuits and other supplies before heading off down the road, slowly licking a Callipo ice lolly. A short distance on along the road through the pretty village I passed the church, and after this a path headed off to the right to reach another little village called Ashley. In Ashley there was a pretty pond, but the next stretch of walk was fairly boring as the path headed along roads northeastwards, eventually descending down to cross the Cambridgeshire / Suffolk border to reach the River Kennett. This marked the start of a long loop in the walk, as the path started following the southern bank of the river southeastwards. There was not much water in the river and the bed seemed fairly overgrown, but as I headed along it I occasionally saw areas of more water. It made for a pleasant walk, and it was disappointing when the river reached the village of Dalham and the path left the river. Having said that, the village itself was nice, and at one point there was a large conical brick structure by the road that I did not recognise - when I got back home I looked it up on the Internet to find that it is a Maltings. Form this a path led up between two rows of trees across what was obviously parkland to reach Dalham Hall, once home of Cecil Rhodes, the founder of Rhodesia. Next door was a smart and small church, and as I headed along the road and then footpath past the hall my mind wandered onto the way that Rhodes had altered the history of Africa single-handedly, for better or worse. A long and fairly undistinguished walk followed through woodland, a long looping walk that I found boring for some reason, eventually dropping me out onto a housing estate in Gazeley. Wayposts showed me the route the estate, and when I reached the church I was pleased to see that there was a pub open nearby. I decided that as I was about halfway through the day I could stop off for a while, and I entered the pub and took my pack off. After ordering my usual two pints - one of bitter, the other of orange and lemonade - and a pack of crisps, I sat down as the television was on Sky, waiting for the start of the first match of the Premiership football championship. This was something I was hardly interested in and so I chatted to some of the locals for a while, who were very welcoming. Indeed they were so welcoming that I decided to stay for another pint of orange and lemonade; I was not pressured for time, and still had all afternoon to walk the rest of the day. I wanted to camp as near dark as possible, although I had no idea where this would be. Two pints of orange and lemonade is a bit much for me, and the fizziness of the lemonade made me feel slightly queasy. As I pulled my rucksack onto my shoulders I knocked an empty glass off the table but fortunately this bounced and did not smash. Apologising, I put the glass onto the bar and headed out into the sunshine. The road took me past the church, and a few yards afterwards I saw Terry, a colleague and friend from work, cycling past. He was on a bike ride from his home in Royston, and the odds of us bumping into each other must have been quite small. We chatted for a few minutes and he invited me back to the pub, and although it was very tempting I did not want to backtrack and so we parted as Terry continued on to the pub and I headed on along the road. To the north of Gazeley I could not see the windmill marked on the map, but I did not look too hard at all and instead continued on along a road that descended to reach Needham Street. Here the path thankfully headed away from the road, heading across fields. Suddenly I started to feel queasy, and about halfway across the first field I was sick, with most of the drink that I had had in the pub seeming to come up. This is not the first time this has happened on a walk, and after taking a couple of minutes to get my breath back I headed on along the path with slightly shaky legs. The path ended at a main road that was quite busy, and I had to follow this as it headed under the A14 dual carriageway, after which a minor road branched off to the left, heading under the railway line before a track called Slade Bottom took me off to the left. This passed a large quarry that was still in use, with occasional pieces of large equipment visible through the fence as I walked past. At the main entrance to the quarry the good surface underfoot ended, and a far rougher track took me on, curving to head northwards as it passed a series of older, disused pits. After the last of these the track became a path, and I stopped for a moment to take some photos of some sunflowers growing on a wide, unploughed stretch of ground. As I did so I was startled to see a deer to jump up and stand looking directly at me, allowing me to take a couple of snaps of it before it bounded away through the long grass. Such chance encounters with wildlife really make all of the stress of walking worthwhile, and I strode on feeling much better about life than I had done before. The path continued straight on northwards, before eventually dropping me off in the little village of Herringswell. As with most of the villages in the area this seemed quite nice, and I plodded on along the road through the village, which soon became a track that took me on towards the next village Tuddenham. By this time I was in need of another rest, but I decided to plod on to Icklingham, which is the earliest possible spot that I could stop for the night. On the way I passed a memorial to air crews from a nearby airfield, and by the time I reached a farm I had to take my rucksack off in order to change Ordnance Survey maps. 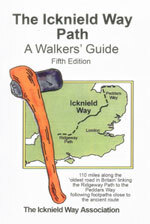 For the Icknield Way walks I have been using an early edition of the official guidebook, which contains very good descriptions of the route allied with sketch maps of the walk. However, these maps are not to scale, and in places this really threw off my estimates for how long it would take to reach a certain place. Therefore I had to also have the maps open to check distances, although the guidebook was still extremely useful. The next stretch of track was a case in point, and as it headed across a very attractive nature reserve I found that I could hardly wait for the end to come. After crossing the A14 the scenery had suddenly seemed to change, the rolling fields being taken over by rougher, sandier terrain, a sign that I had entered the Breckland heathland. Suddenly I came across a beautiful church with a thatched roof, and on the other side there was a pub and shop. The pub was not due to open for another hour at six, but fortunately the shop was open. I went in an bought some chocolate, and the boy serving behind the counter kindly agreed to fill up my water bottles for me. This meant that I had enough water to see me through the night, and although it had been my intention to take a rest here I decided to plod on. As I was wild camping I wanted to reach somewhere remoter before putting up my tent, and the best option from the map seemed to be a track in the large King's Wood. Walking there would also mean that I would have less distance to cover tomorrow, and as the heat of the afternoon was slowly starting to decline I plodded on. As I walked across fields towards Weatherhill Farm I started to feel depressed, a combination of the effects of the death of my Grandmother and of my having handed in me resignation at work the previous day, so that I could follow Sencan down to her new job in Southampton. I was filled with doubt about whether I had done the right thing in resigning, and as I got increasingly tired these concerns starter to weight heavily on my mind. This continued as the path skirted around the farm and the way turned to head northwards through the large woodland. The track through the woods was sandy and this allowed my sore feet some respite, as the ground would give with every step. I had walked along this part of the way before as part of a walk from Bury St Edmunds to Thetford, and although I could remember nothing about it, it felt good to be on terrain that I had walked before. The track was rough and rutted in places, but was easy to follow, especially as there were many short branches off the track that allowed me to divert around the worst bits. At one point a couple of four by fours came bouncing past, the people inside seeming to enjoy the bumpy drive. The woodland was surprisingly varied, and as I strolled along I started to spy many possible spots in which to pitch my tent. However as I was still feeling relatively fit I continued on, passing a white van packed with stuff in the middle of the forest - someone seemed to be using it as a base for a while, possibly even living there. Eventually I approached the northern edge of the forest near Queen Mary's Avenue, and here I chose to set up camp. I could have walked further and there was still enough daylight, but I doubted that there would be anywhere as good to camp for another few miles. I did not want to walk too far off the track but I did want to be slightly obscured, and so I walked around for a few minutes to look for the ideal spot. Eventually I settled on a spot in a dark area of trees, and I swept an area clear of trigs and small branches in order to put up my tent. Due to my fatigue after the long day this took me far longer than usual, and once it was pitched I walked back to the track to see that the tent was slightly obscured but could still be seen. I was far from caring, and retreated back to my tent exhausted, still feeling slightly depressed. It had been a long and eventful day, but I still had a long walk to look forwards to the next day. The exception to this is the stretch from Dullingham station to reach the Icknield Way nearly two miles to the east. Leave the station and immediately turn right, to follow Station Road as it heads southeastwards, immediately turning to the left and then the right to regain the same direction. After about a mile a crossroads is reached by the B1061; at this junction cross over and continue on eastwards for about half a mile. When the road curves to the left turn right along another road for a few yards, before turning left down a footpath. Initially this heads to the left of a house and garden; after a few hundred yards the junction with the Icknield Way is reached on the left at a plank bridge. The rest of this walk follows the Icknield Way. This makes a total distance of 24.9 miles, with 929 feet of ascent and 1010 feet of descent. P20078119084	The River Lark at Temple Bridge. P20078119094	Icklingham church. P20078119097	The track leading towards King's Wood. P20078119102	The track heading northeastwards through King's Wood. P20078119108	My tent in King's Wood.